Locals in Aleppo refute reports in the Western media claiming that the buses evacuating the militants had been fired upon by pro-Assad forces, RT’s Lizzie Phelan reported from the scene. “Here [in Aleppo], I’ve been speaking to a local journalist and locals who have been here since dawn... They say they heard no sound of gunfire,” Phelan reported from Aleppo. 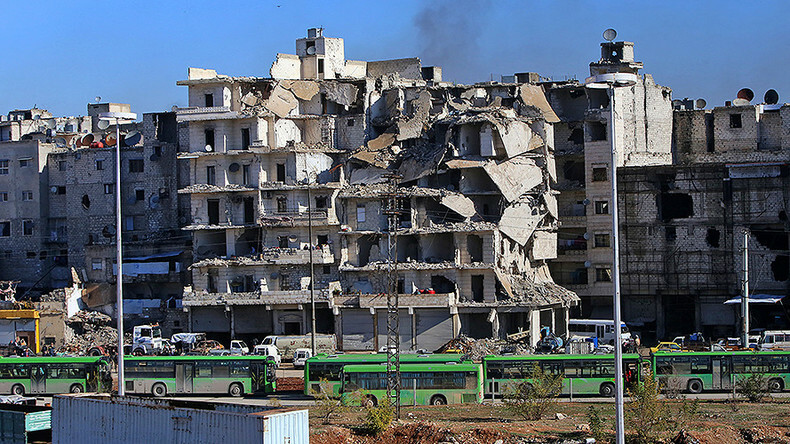 About 15,000 still remain in the Aleppo neighborhood that was previously held by the militants, Phelan said, adding that, out of those 15,000, 4,000 are rebels and their family members that are due to be evacuated. The Syrian Army has said that they guarantee the safe passage of these evacuees out of Aleppo. The process is being monitored by the Russian center for reconciliation. Meanwhile, the second and the third bus and ambulance convoys have left eastern Aleppo carrying militants and their family members to one of the city’s neighborhoods, where they will be transferred to other vehicles heading for the Idlib province, the Russian Defense Ministry said in a statement. All the buses and ambulances are being escorted by the officers of the Russian Reconciliation Center and the members of the ICRC, the ministry added. Earlier on Thursday, Reuters reported allegations that Syrian forces opened fire on the medical convoy in eastern Aleppo, killing at least one person. 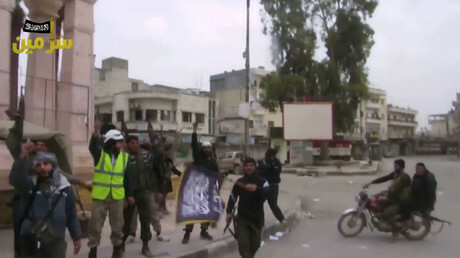 Reuters also cited an interview posted “via an online messaging service,” in which a man who said he was a civil defense worker claimed snipers were targeting people in the convoy. Later on Thursday, spokesperson for the ICRC in Syria, Ingy Sedky, told RT that there were no signs that the planned evacuation would be disrupted by an attack by any side. “They are safe,” she said, referring to the evacuees and humanitarian workers involved in the evacuation. 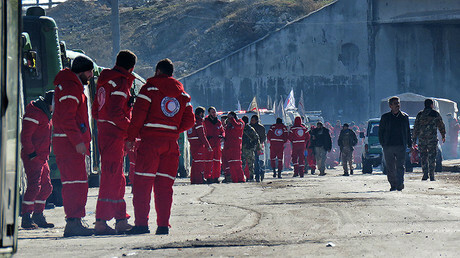 A large-scale humanitarian operation is currently taking place in Aleppo. On Monday, the Russian Defense Ministry said that up to 100,000 people, including 40,000 children, have been evacuated from eastern Aleppo. The Syrian Army has liberated most of the neighborhoods in the eastern part of the city held by Al-Nusra Front terrorists and other militant groups over the past weeks. At present, the militants control just 2.5 square kilometers of Aleppo, according to the Russian Reconciliation Center.